China’s rapid urbanization and increasing energy use are accompanied by deteriorating environmental quality. Understanding the structure of energy use is necessary to address these environmental effects. 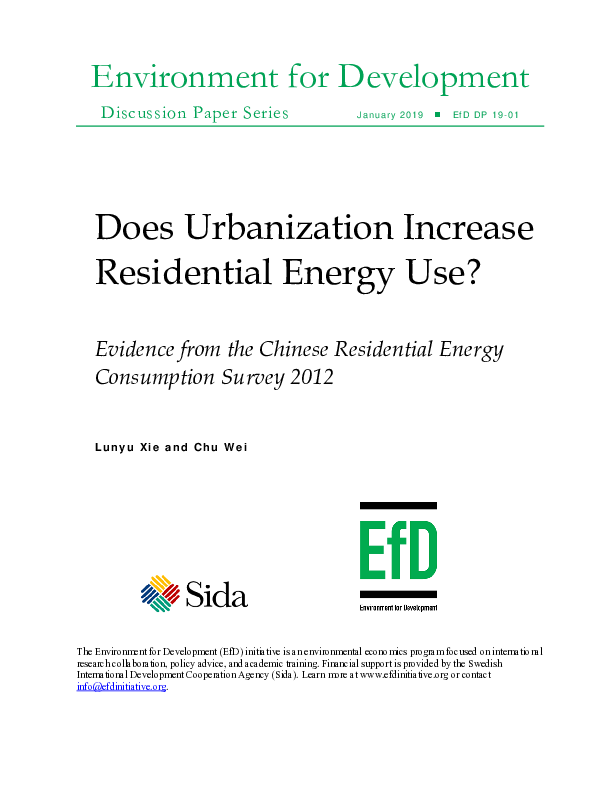 We investigate how urbanization affects residential energy use, using data from the Chinese Residential Energy Consumption Survey 2012 (CRECS 2012) to compare the energy consumption of urban and rural households and identify the factors influencing the differences. We find that dwelling characteristics (e.g., building infrastructure, residential area), household characteristics (e.g., household size, income), and unobservable factors (e.g., the surrounding environment, living habits) all play roles in shaping residential energy consumption.Urbanization directly decreases energy consumption through differences in the environment outside the household (markets, infrastructure, etc. ), while it indirectly increases consumption through the presence of central heating, decreased household size, and increased household income. We find a positive total effect — urbanization increases residential energy consumption in total. We also find that urbanization shifts energy consumption away from coal and toward electricity and gas. In addition, we distinguish between onsite urbanization (formation of towns based on rural markets) and offsite urbanization (movement to large cities). Compared to onsite urbanization, offsite urbanization shifts energy consumption toward electricity and gas by a larger magnitude. Finally, we project residential energy use in 2020.